With its dense forests and plentiful rainfall, West Virginia and the rest of the Central Appalachian region is an almost perfect habitat for hundreds of varieties of wild mushrooms. For the mushroom hunter, this vast bounty provides sheer delight and considerable challenge, for every outdoor excursion offers the chance of finding a mushroom not previously encountered. For both the seasoned mycologist and the novice mushroom hunter, Mushrooms of West Virginia and the Central Appalachians serves as a solid introduction s of the region. Some 400 species are described and illustrated with the author's own stunning color photographs, and many more are discussed in the text. Detailed mushroom descriptions assure confident identifications. Each species account includes remarks about edibility and extensive commentary to help distinguish similar species. A comprehensive glossary of specialized mycological terms is provided. This easy to use, detailed guide is for both the beginner and expert mushroomer. Organized for convenient field use, the guide describes and illustrates approximately 400 species. High quality photographs of mushrooms appearing in their natural habitat make the identification process easier. 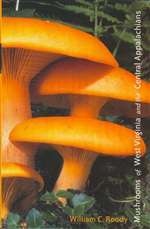 Descriptions include common names, a discussion of look-alike species, scientific names and extensive commentary regarding edibility and traditional cultural uses for mushrooms.